Horst Seehofer and his party met yesterday seeking a response to a hard-fought agreement to reduce migration. GERMANY’S INTERIOR MINISTER Horst Seehofer has said he wants to resign both his office and his position as head of the hardline conservative Bavarian CSU party, throwing into question the future of Chancellor Angela Merkel’s coalition government. “He wants to step down as party chairman and interior minister” as he enjoys “no support”, CSU party sources told AFP yesterday. But CSU parliamentary group chief Alexander Dobrindt “does not want to accept Seehofer’s resignation”, participants in the party’s hours-long huddle in Munich said. If Seehofer does resign, it is unclear whether the CSU would seek to remain in coalition with Merkel’s CDU and offer a replacement interior minister. Alternatively, it could break up the two parties’ decades-long alliance, effectively depriving Merkel of her majority in parliament and pitching Germany into uncharted political waters. 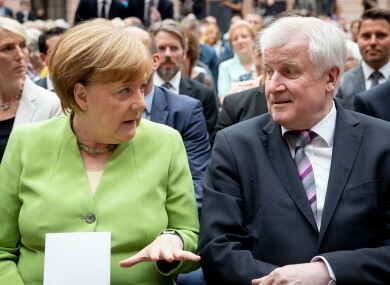 Seehofer and his party met yesterday seeking a response to a hard-fought agreement to reduce migration into the European Union and so-called “secondary migration” between member states hammered out by Merkel at a leaders’ summit last week. The CSU had pressured Merkel for weeks to either agree to its plan to turn away at the border asylum seekers already registered in other countries or to achieve EU deals that would have the same effect, setting her a deadline of yesterday. Sources said Seehofer complained in yesterday’s closed meeting with party bosses that he had endured a “conversation with no effect” with the chancellor on Saturday about whether the EU-wide deal and string of bilateral agreements she struck met his demands. Meanwhile, the general secretary of the CDU party Annegret Kramp-Karrenbauer said in Berlin the chancellor’s camp was “united” behind “effective, humane solutions together with our European partners” after its own leadership gathering. Email “Future of Merkel coalition throw into doubt as German interior minister offers resignation”. Feedback on “Future of Merkel coalition throw into doubt as German interior minister offers resignation”.